Haryana Steelers will face Tamil Thalaivas in an inter-zone wildcard match in Kolkata, which will also mark the last game of the season for the Steelers. After their first encounter between the two ended in a tie, both teams would be eager to end the season on a winning note. It hasn’t been a best of seasons for the Haryana Steelers despite some brilliant individual performances. The trio of Monu Goyat, Vikash Kandola and Naveen have scored plenty of points throughout. Performances of Kuldeep Singh and Sunil have been inspiring but not consistent. The likes of Sachin Shingade, Mayur Shivtarkar, Parveen and others haven’t contributed consistently as well. Monu Goyat’s recent form, Vikash Kandola’s impressive performances have been the positives for the season. Even in the last match against Jaipur Pink Panthers, Haryana Steelers had a comparatively better second half but left it late to win the match. The Steelers will step on the mat one last time this season and give their all against the Tamil Thalaivas, who will also be hoping for a win in a very disappointing season. 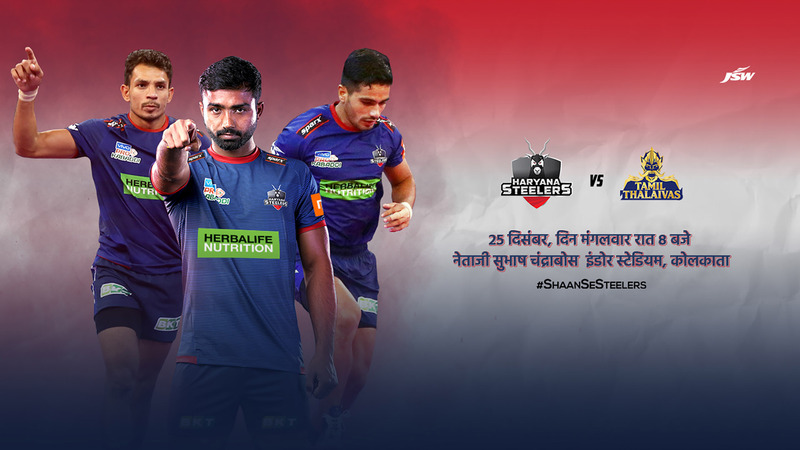 With pride to play for in the last game, Haryana Steelers would leave no stone unturned and end the season with a win and give their fans a reason to cheer as they exit the Season 6 of the Vivo Pro Kabaddi League.